No meat, cheese, wool or ivory-keyed pianos — basically nothing that comes from or is made from an animal. That’s what Pitt’s animal wellness club preaches on campus. 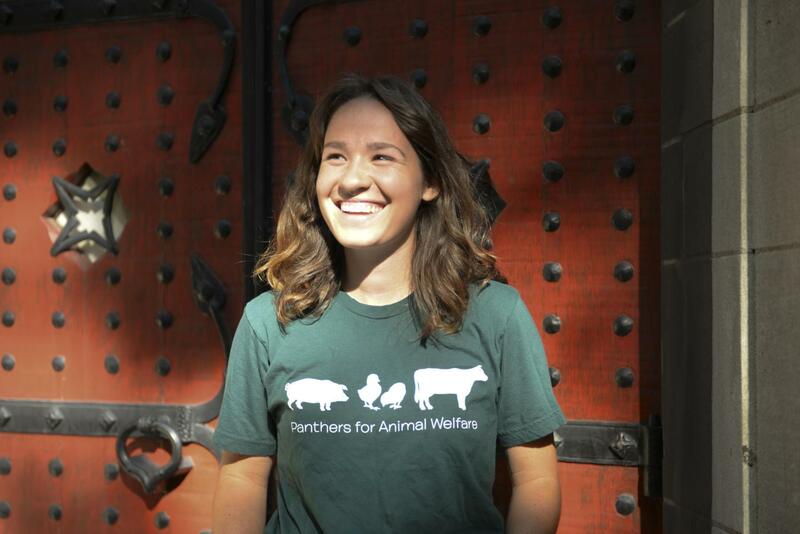 Panthers for Animal Welfare — PAW for short — is an activist club focused on spreading awareness about the effects that food, fashion and other lifestyle choices have on animals and the environment. The club seeks to educate the public about animal welfare issues through discussions about animal welfare legislation. Sarah Conboy, a rising senior majoring in developmental psychology and early childhood education, had been a vegetarian the majority of her life, before switching to veganism in the fall of 2015 when she first entered college. Conboy started researching the dairy industry and her ethical and environmental concerns prompted her to become a vegan. So she began her search for a group of like-minded people who practiced veganism with an emphasis on animal welfare. She went to the first ever VegFest, a vegan food festival put on by PAW, and decided to join the small club in fall of 2015. Three years later, Conboy is now its president for the upcoming school year. The club was founded five years ago on the premise of advocating for the wellness of animals, meaning veganism and vegetarianism weren’t the club’s only focus. Throughout the year, the club often tables at Market Central with information on ways to live a more animal-friendly lifestyle, like using cruelty-free beauty products — products that are not tested on animals — and not consuming goods from companies that use animal byproducts. “We’re trying to make people conscious of the things they’re consuming, so they can go up to the vegan station and feel good about what they’re doing for the Earth,” Conboy said. According to Nick Goodfellow, the sustainability coordinator for Sodexo, Pitt Dining tries to be as conscious as possible about where its food comes from before it is served to thousands of students daily. Pitt Dining tries to utilize as much local food from small businesses — as well as humane and ecologically sound food — as they can. For example, all apples on campus are purchased from Dawson’s Orchards in Enon Valley, Pennsylvania, located about an hour away. The milk is hormone-free from Schneider’s Dairy, a local dairy company. All of the coffee served at Market Central and the Perch is Aspretto coffee, which is fair trade and organic. Market serves a majority of its chicken from Gerber Poultry in Kidron, Ohio, which sources its chicken from more than 150 family-owned growers who do not use growth hormones or antibiotics. Conboy said it’s promising Pitt Dining is receptive to feedback from students — Pitt Dining implemented more vegetarian-friendly options shortly after PAW’s requests. “They complied with our request for a meatless monday for a really long time, so it seems like they really care about the needs of vegan and vegetarian students,” Conboy said. Outside of their work with Pitt Dining, PAW advocates for animal welfare with fundraising initiatives. PAW raised money for the Beagle Freedom Project and its efforts to help dogs once used in experiments to live a normal life through vegan bake sales that take place once or twice a year in Posvar or at night along the streets of South Oakland. According to Ethan Phillips, a rising senior majoring in gender, sexuality and women’s studies and the vice president of PAW, the vegan bake sales are a quick, easy way to raise money for a good cause. It shows there is more to vegan and vegetarian food than just salads, he said. “We actually made an Oreo-based dessert, which just goes to show how many vegan and vegetarian options are out there, and we donated the money raised that night to the World Wildlife Fund,” Phillips said. In the fall, the club hosted a flyer campaign that lists companies that don’t test on animals and informing the public about companies that do. And last year PAW collected 132 pounds of food to help Chilis on Wheels, which serves warm, healthy and sustainable vegan meals to those in need across the U.S. as part of the month-long Very Vegan Food Drive. The club also screens movies like “Blackfish” to educate students about their cause. “Last year we showed ‘Cowspiracy,’ which is more about the environment, so it’s showing different sides of animal rights since there are many different sides to our cause,” Phillips said. In the upcoming year, Conboy said that the club plans to take on a project with Besto — a Pennsylvania-based startup tech company — to film videos of Pittsburgh-area shelter pets and post them on the company’s app in order to help get them adopted. “[Besto] takes the idea of the viral video and puts that on a smaller scale. You get to see the animal’s personality instead of on a typical adoption site, where you only get to see their picture,” Conboy said. To raise the club’s number of members — they currently only have 15 active members — and to promote more community service within the club, PAW also plans to visit animal sanctuaries this upcoming school year. PAW has been in contact with Hope Haven and Animal Friends, and continues club-bonding events at Pittsburgh restaurants with vegan options, like Spak Brothers in Bloomfield. And since they’ve applied for some more monetary support — they requested for a grant from peta2, the youth outlet of PETA — they can promote animal welfare on a larger scale outside of the University. “We want to be more visible and keep spreading awareness on animal welfare-related issues and support efforts to help animal-related causes,” Conboy said. Yuting Xiong helped with reporting.